And so, they continued to see each other, the Army Air Forces 3-man site selection board and the community known as “Moran.” Over the course of about two weeks, the selection board, along with several personnel from the Little Rock Corps of Engineers checked out Moran from ‘head to toe.’ There certainly would not be the earth-moving problem at Moran. But, would there be enough room in the public schools for the influx of new students? Where would approximately 1,500 construction workers find lodging? What about transportation? Nearby rail service was important, as most troops and much of the construction materials would be arriving by train. And good highways, community support, water, electricity and disposal facilities for sewage were essential. As it turned out, Moran was just what the Army Air Forces needed… and wanted. The local community was excited and very receptive. 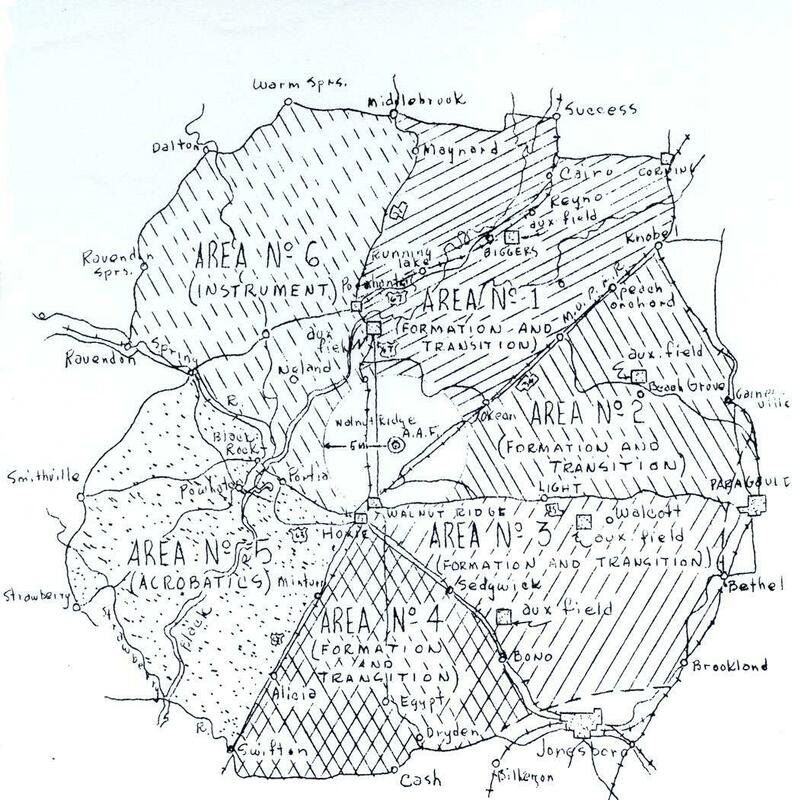 On April 15, 1942, after a two week ‘courtship,’ armed with maps, letters of support, preliminary surveys and plans, core drillings, and more, the site selection board recommended the Moran community site as a substitute for Halls. The Commanding General of the Southeast Air Corps Training Center approved the site on April 20, 1942. On May 12, the War Department directed the Army Corps of Engineers to build an air field in the Moran Community. The new field was named Walnut Ridge Army Air Field – taking the name of the nearby town of Walnut Ridge, which had a population of 2,013. The air field was designed to accommodate 5,114 military personnel and a civilian workforce of 976. The selection of Walnut Ridge was an unexpected good fortune for northeast Arkansas, as it created approximately 1,500 good-paying construction jobs. Folks who had been unemployed or working for 50 cents to a dollar per day could now make that much in an hour. The air field brought the area out of the depression. Construction of the facility began June 20, 1942. A new entrance road from U.S. Highway 67 to the air field was started in July. For several years that road was the widest paved highway in Lawrence County, two feet wider than U.S. Highway 67. The road entered the air field’s west boundary at the southwest corner of the Mt. Zion Cemetery. The Mt. Zion Church was just north of the cemetery, and the Mt. Zion School was across the lane west of the cemetery. The Moran School, located near the heart of the new air field site, just over a mile east-northeast of the Mt. Zion Cemetery, was torn down to make way for the air field. The air field was activated August 15, 1942, with the arrival of key personnel. Buildings were not ready, and a temporary Headquarters was established in the Mize Motor's building in Walnut Ridge. A group of 100 troops arrived on August 17, but there were no facilities ready at the air field -- so the troops were sent to the former CCC Camp near Pocahontas. On September 1, the first Station Hospital was set-up in the abandoned CCC Camp Infirmary. By September 5, a few buildings were ready and Headquarters moved onto the air field. Due to the delay in moving from Halls, Tennessee to Walnut Ridge, this air field wasn’t ready when needed. The first three classes on the flow chart programmed for Walnut Ridge had to be sent to Blytheville - which had a few weeks lead on this field. But, even Blytheville had to use circus tents and oil covered 'temporary' runways. Throughout September, hundreds of personnel arrived, moving into crude, temporary buildings - most wood-framed with green 'gum' lumber on the outer walls, covered with black felt paper. The roofs were decked with any available low grade lumber, covered with roll roofing. There was no insulation in the walls, and no interior wallboard on the inside. With no sidewalks, there was dust or mud most everywhere. Later there were wood sidewalks, but these were prone to 'float' away when it rained. Finally, on September 28, the air field hospital buildings were ready and the Station Hospital was relocated to the Walnut Ridge Army Air Field. Fifteen patients were hospitalized during the time it was at the CCC Camp. Though far from completion, the air field received its first class of aviation cadets (43-B) on October 10, 1942. Training began two days later, October 12, at 1:00 P.M. There were 59 instructors and 140 airplanes. Initially, training conditions at Walnut Ridge, and at many other hurriedly-constructed air fields, were miserable - But the U.S. was at war and these pilots had to be trained in a hurry! 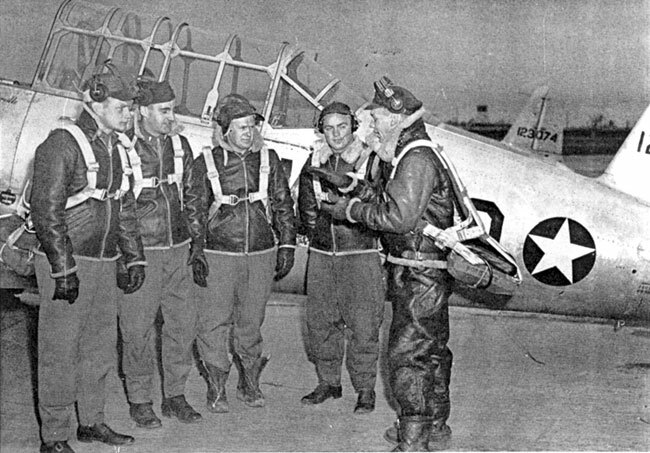 The rapid shift from glider pilot training to basic flight training and the almost overnight beginning of the Training Department resulted in inadequate planning. The eight operations buildings were unfinished and dispatching was done from one building near base operations. Auxiliary fields were not ready and there was a shortage of ground (academic) instructors. The ramp was unfinished and only one of the three runways, 4-22, was ready for use. 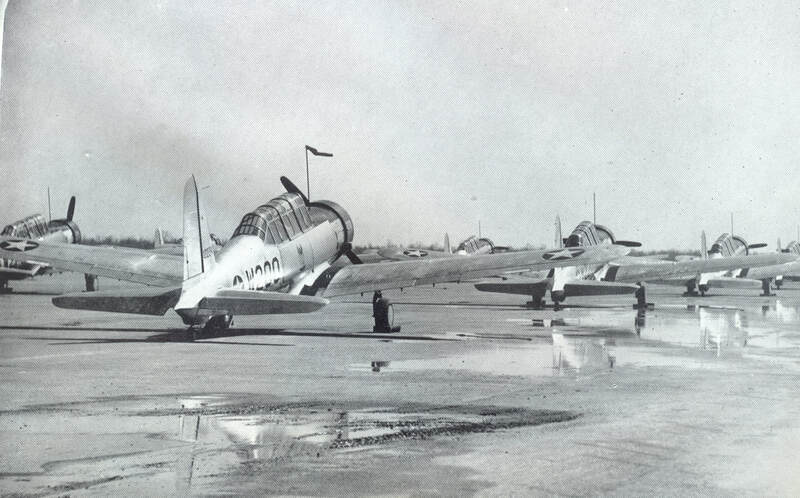 Airplanes were parked and serviced on the dusty ground near the runway, and great clouds of dust filled the sky when the powerful engines of the BT-13s were started. Streets were unpaved and wood sidewalks led to major buildings, barracks were un-insulated with simple furnishings. There were shortages of instructional materials. Most instructors had only 150 to 200 hours more than the students. Dispatchers and crews were not familiar with their duties. Initially, three squadrons were crowded into one building. Parachutes were not handy. Night lighting was crude, and landing facilities were limited which cut landings per student to 100 compared to 160 which they later received. When training began, there were only 6 Link Trainers, and the department operated 18 hours daily to provide the minimum training requirements. The typical barracks were 20x100 foot buildings with pine floors. There were sliding windows for ventilation and coal space heaters for heat, and a few overhead light bulbs. Enlisted men's open-bay barracks had 32 folding cots and a small rack for hanging clothing. Cadet and Officers’ barracks were a little better: partitions provided some privacy, and there were fewer beds, providing more living space per person. There was no plumbing in the barracks. A detached Latrine building was provided for each group of 6 to 10 enlisted and cadet barracks. Officers’ latrines were connected to their barracks. This school, like many others, was pressed into operation before its facilities were ready and before the Department of Training was adequately organized. The health of the students was poor due to the rough living conditions. The hastily constructed barracks were often cold; the lack of sidewalks resulted in wet feet and colds, the food was prepared under adverse conditions. It was impossible to give proper military training because of inadequate space. High standards of dress were out of the question because of the alternating mud and dust and the lack of cleaning and laundry facilities. Gradually things improved. Wood sidewalks were added, the ramp was completed, all runways were paved, night lighting was improved, and the five auxiliary fields were finally operational. Instructors gained more experience, and more operations buildings were completed. Finally, 27 Link Trainers were available, which permitted students to receive more hours – and the department could work fewer hours. At the peak of training, some 250 aircraft, primarily BT-13s were in use at the air field and the flying school had over 150 flight instructors. In 1943 scores of new buildings were completed, including 260 new and modern apartments. Construction on the air field facility and its 500-plus buildings and structures continued throughout 1943. In fact, a new clay-tile Base Sales Store opened for business on December 31, 1943. During the course of 22 months in which flight training was conducted, 5,310 pilots entered the school. Sadly, 42 young men (students and instructors) were killed in training accidents. Despite its crude and trying beginnings, the Walnut Ridge AAF graduated 4,641 pilots to serve in WWII. The last class graduated June 27, 1944. On the brighter side, 82 babies were born in the base hospital, including 42 baby boys! By May 1, 1944, 110 Marriages had been performed at the Base Chapel, 76 Protestant and 34 Catholic.